These Were Our First Ever Facebook Statuses, What Was yours? 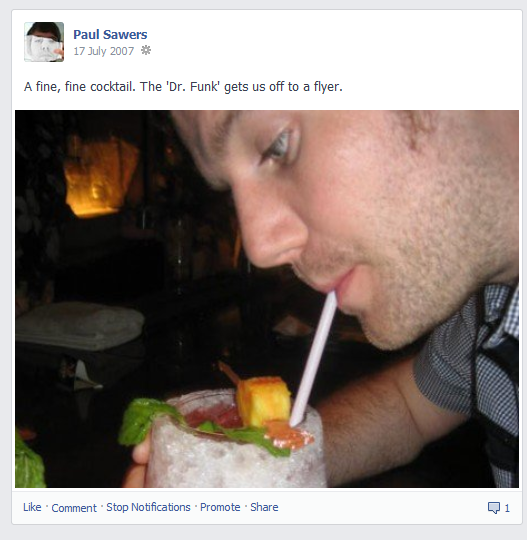 As Facebook celebrates its tenth birthday today, we were drawn to think back to our early days using the service and our first ever Facebook statuses. Most of us have changed our approach to using Facebook over the years, so here various members of the TNW team look back at how their relationship with the social network has evolved. TL;DR? It’s complicated. My early days on Facebook were spent accumulating friend connections to everyone with whom I went to school – most of whom I’ve interacted with precisely once each in the years since. As I gravitated to Twitter, my usage dropped off before Facebook settled into a comfortable place in my life where I tend to check it a couple of times per day but usually not much more. Facebook Messenger is a useful tool from time-to-time, and I often use my login as a convenient way of setting up an account on apps I try out, but it’s hardly a core part of my daily life. I definitely could get more out of Facebook if I put more in, but for me it’s a question of time. Twitter fits around your life; Facebook is more demanding of your time – time I don’t tend to have these days. Matt was into location-based networking before it was cool. My Facebook use grew very quickly to crazy proportions between joining and around the middle of last year. However, since then, my social media allegiance has swung massively over to Twitter with me posting to Facebook less than 1-2 times a week (if that!). I love it less than I used to, but it is still my destination of choice for brief personal social interactions with family and friends (now and then!). Oh gosh, the era when Facebook forced you to write statuses that begin with action verbs! Natt is this, Natt is that. As far as I can tell, in 2007, Natt is a dork. I can’t say I quite remember what this status referenced other than the obvious. I had just graduated high school and joined Facebook to keep in touch with old schoolmates and to-be friends in college. Facebook acted as a bulletin board of feelings, upcoming events, and occasionally, the very quirks that keep me as random as ever. Whatever the reason was for practicing those light saber skills, I hope they become useful when the zombie apocalypse hits. I’ve always been a casual lurker rather than a super-engaged Facebook user, but my opinion of it changed massively when I left the UK for Asia in 2008. Initially, few people in Thailand used Facebook, but these days it is a phone book used by all. People in the West are more negative about Facebook, perhaps due to fatigue and privacy concerns, but I’ve seen its power to bring people together and be their Internet experience all on its own. Facebook is unique in having over 1 billion users per month, and I think it and Mark Zuckerberg have the potential to do a lot of good improving access to information and communication across the world. I used to post tonnes of photos to Facebook, of holidays and such like. I hardly post any photos any more – I’m really not sure why. I guess it assumes people are really bothered about seeing your snaps, when in fact they’re not. These days, Facebook for me is more of a ‘Visible email platform for groups’, if that makes sense. I get lots of group messages, about organizing holidays, birthday parties and such like. I don’t leave many status updates, but when I do it’s typically sharing a video or news article that I think is genius in some way, or the occasional ‘funny’ pun that I’ve pilfered from the Internet. I’m definitely sensing a gradual shift away from Facebook as a communications platform. I discovered tons of people I know use WhatsApp, and I have maybe 5 or 6 groups set up in there, for organizing things and sharing photos/videos that perhaps aren’t best suited to Facebook. I also discovered a good friend who now lives in Korea uses Kakao Talk, so I’ve been using that too. I think Facebook will definitely still have its place, and I’ll probably not stop using it, but there’s plenty of alternative avenues for sharing and communicating now than when I first joined Facebook in 2007. I see Facebook more as a platform ‘for everyone I’ve ever known’, and other services such as WhatsApp for actual good friends. Ken was another location-based networking pioneer. Josh joined Facebook the earliest of anyone from TNW. I can’t really find my first status. Seems like some are missing, but I never really got into posting status updates on FB. I joined Facebook when it first arrived at UC Berkeley in the fall of 2004, back in the days when it still had the “the.” There was a ton of buzz on campus about the service that fall as students signed up to check out their classmates. I don’t use Facebook on a daily basis anymore, but it’s still the default method for keeping in touch with old friends and extended family. My News Feed has become extremely noisy, but no other social network has the near-ubiquitous reach that Facebook does. Now almost ten years later, it’s easy to take for granted how convenient it is to have almost all of our contacts in one place. Dare you share your first Facebook status with us?